To yoga or not to yoga? Laurent Roure knows his Yoga. 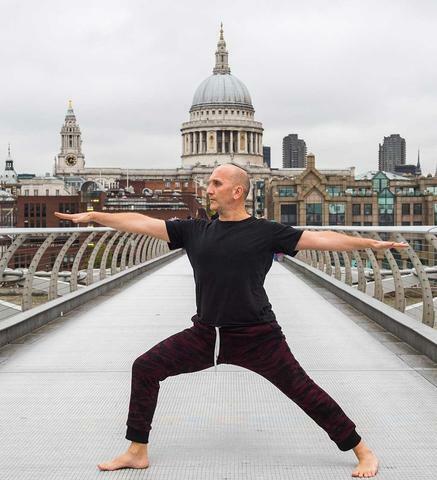 Practicing for almost 20 years and teaching for 7, he has mastered the art of what he calls ‘Mindful yoga’. Laurent, ‘Mindful Yoga’ sounds superb. What is it? It’s about a level of self-awareness that makes each person’s yoga experience unique to them. It’s based on classic Hatha Yoga but twisted a little to be more personal. More of an interpretation I’d say. It’s very important not to lose the principals of yoga – they have been honoured for thousands of years for good reason. I just translate them into something more accessible and inspiring for people today. I bet they appreciate it. Do you do something different every class? I try to work on different sections of the body. So – spine one week, feet the next. Throughout this, I teach pranayama which is all about controlled breathing. It balances your energy, stabilises your moods and gives you the stillness and focus you need to experience mindfulness. It’s a bit like meditation really. What inspired you to get into yoga all those years ago? I would see all these people queueing for Ashtanga classes at the gym, and I just thought I’d find out what the fuss was all about. It was very spur of the moment and wow – I was immediately hooked. I felt the very real excitement of discovery. Just going to the gym was such a bore in comparison. It was a real community that connected with each other. I just loved it. So it has many more levels than just working out can offer? Absolutely. Yoga means union. It brings your spirit, mind, energy, breath, strength and body together to be one. Many people. So many teachers and gurus have influenced me. John Stirk is probably my biggest mentor. He taught me how to loosen my body more and be more aware of how I move. Any learner should work with the information they have been given and make it their own. That’s how it becomes unique. Is it ever too late to take yoga up? Never. Yoga is for everyone. I’ve got students starting at 60 plus. Getting old is not important if you’re happy with mind, spirit, breath and body. Yoga helps with that and sort of puts a youthful shield around you by making you happy. Know what I mean? Not all yoga is that physical. In my classes, each person is doing something different – something right for them. I don’t tell people what to do – I offer them ideas. One of my recent classes was mostly men, and I suggested that we practice Nadi Shodhan (aka alternate nostril breathing). It helps to balance and relax people. They all did it and eventually found a communal rhythm. Hatha Yoga: the gentlest type – one to ease beginners in. Pranayama: ‘prana’ means ‘breath’ and ‘ayama’ means ‘control’. Put them together and you have: controlled breathing. Mindfulness: a mental state that gets you focussed on yourself in the here and now. Very therapeutic. Ashtanga: the intense type – physical, athletic, sweaty and a great way to detox. Nadi Shodhan: breathe in one nostril and out the other. Repeat for a few minutes, and your mind, body and emotions will feel settled.